계성리 마을에 서 있는 고려시대의 석등이다. 이 마을에는 계성사(啓星寺)의 옛터가 있으며, 절터에는 쓰러진 석탑의 일부와 종모양의 부도 등이 흩어져 있다. 이 석등은 일제 때 절터에서 약 200m밑으로 강제로 옮겨진 것으로 정확한 원래의 위치는 알 수 없다. 일반적으로 석등은 불을 밝혀두는 화사석(火舍石)이 중심이 되어, 아래로는 이를 받쳐주는 3단의 받침돌을 쌓고, 위로는 지붕돌과 머리장식을 얹었다. 이 석등은 신라시대에는 8각, 고려시대에는 4각인 일반적인 것에서 벗어나 독특하게 6각의 형태를 취하고 있다. 아래받침돌은 거의 묻혀 있어 윗부분만 보이며, 가운데받침돌은 원통형의 기둥에 띠를 두른 것으로, 띠를 이루는 부분에 각종 무늬를 새겨 놓았다. 원통형의 기둥은 고려시대 석등에서도 자주 볼 수 있는 것이나, 그 모양이 전라도 지방에서 유행했던 장고 모양을 닮아 있어 흥미롭다. 화사석은 특히 주목되는 부분으로, 6개의 돌을 세워 6각을 이루게 하였다. 각각의 돌은 좌우를 반타원형으로 깎아낸 것으로, 옆돌과 맞추어져 6개의 타원형 창이 만들어 졌다. 지붕돌은 각 귀퉁이선이 뚜렷하고 추녀 위로는 꽃조각이 작게 돌출되어 있어 멋스럽다. 꼭대기에는 머리장식으로 보주(寶珠:연꽃봉오리모양의 장식)를 놓았는데, 지나치게 커서 아래를 누르고 있는 듯 하다. 현재까지 알려진 6각형 석등은 북한지역에 2기를 포함하여 모두 4기가 남아 있는데, 이 석등도 그 중의 하나이다. 높은 기둥 위에 놓여 있어 전체적으로 아름다운 균형감이 흐르고 있으며, 건립연대는 고려 전기로 추정된다. 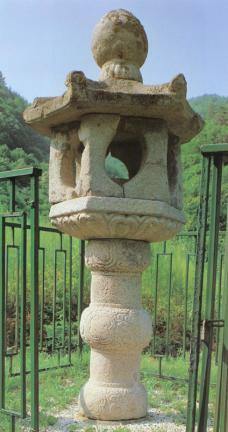 This stone lantern dating from the Goryeo Dynasty is located in Gyeseong-ri village. 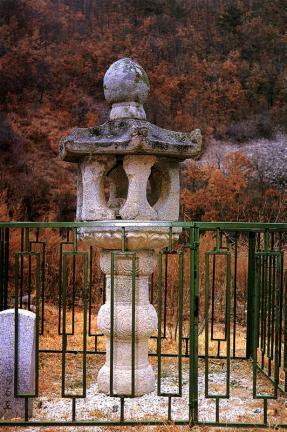 This was once the site of Gyeseongsa Temple, and parts of a stone pagoda and a bell-shaped stupa are scattered around the village. 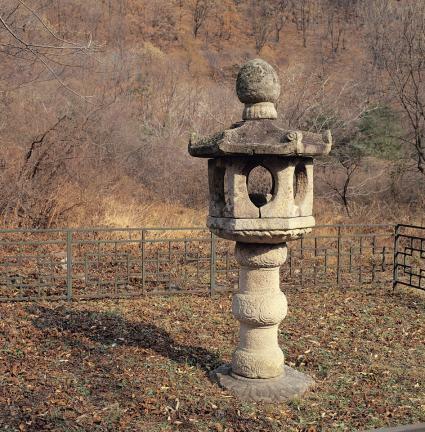 The lantern was forcibly moved 200m below the temple during the time of Japanese imperialism (1910-1945), and its original location is not known. 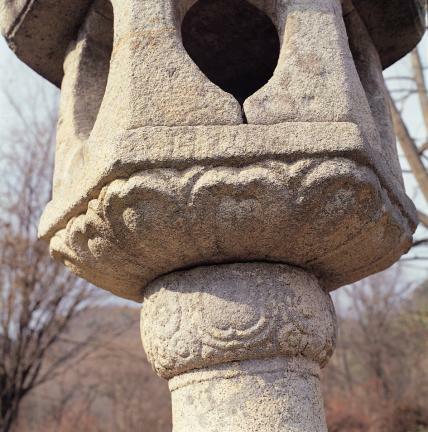 A stone lantern generally consists of the light chamber in the middle, the three-layered base stone at the bottom, and a roof stone and ornamental finial at the top. 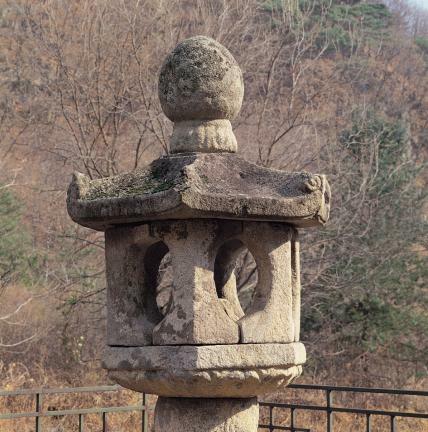 This particular lantern is hexagonal in shape, different from the usual quadrangular style made during the Goryeo Dynasty and the octagonal style of the Silla Dynasty. The lower base stone is mostly buried underground so its top part is barely visible. 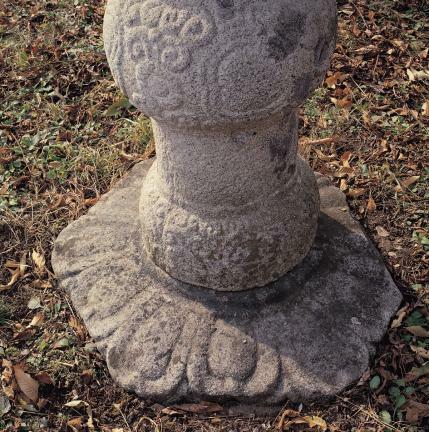 The middle base stone has the shape of a column belted with protruding adorned bands. 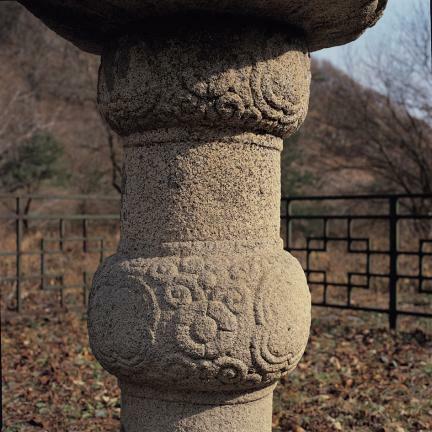 This column style of the middle base stone is common in Goryeo lanterns, but the shape resembles a janggu (a Korean traditional double-headed drum), which was popular in Jeolla-do. Of special note is the construction of the light chamber, which is composed of six stones forming a hexagon. 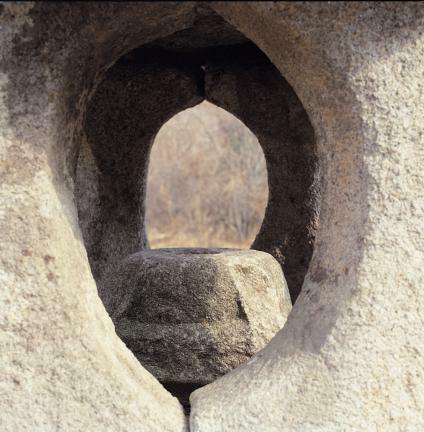 The right and left of each stone are carved with a semi-oval shape, so the six stones are put together to make six oval-shaped windows for the light chamber. 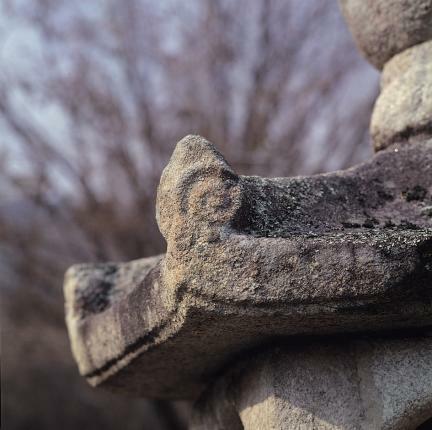 The roof stones have clear angles, and sculptures of flowers are engraved on the top of the eaves. The ball-shaped top ornament is rather big, giving a sense of pressing down on the lower part. 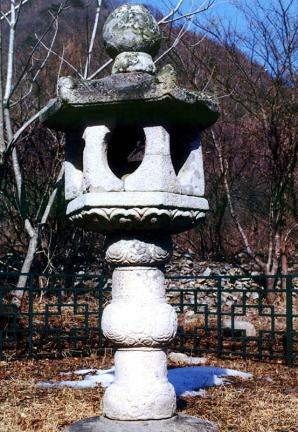 This is one of only four hexagonal stone lanterns remaining throughout Korea, including two in North Korea. This one, with its rather high column, looks well-balanced. 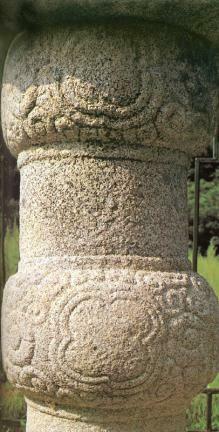 It is believed to have been erected during the early Goryeo Dynasty.